Eternal flame-toasted Turkish s’mores! | more mojitos please! This poor truck was the cause of an unplanned 20 minutes spent waiting by the side of the road. Who needs La Tomatina in Spain when you could just come here!? I did feel for the poor driver, he looked pretty upset as we passed by. Most of the tomatoes looked ok once we eventually drove past so fingers crossed they managed to salvage a few! 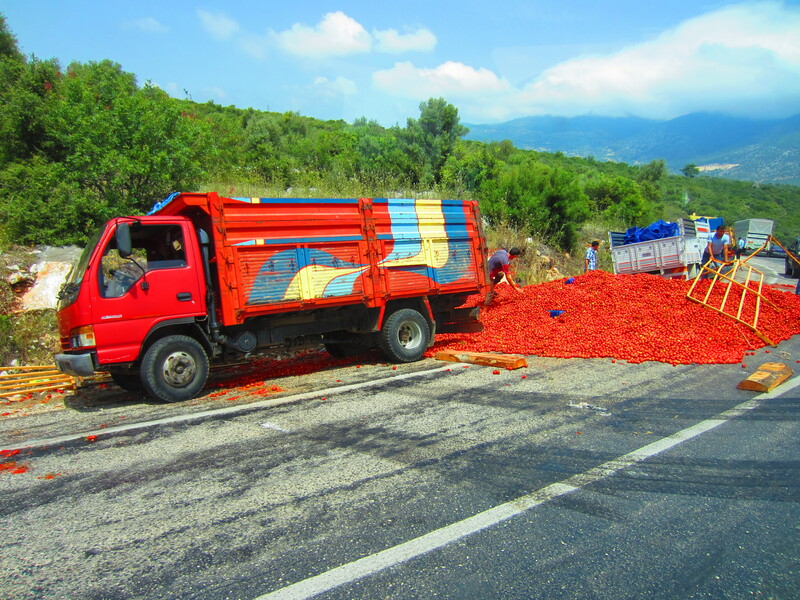 Tomato truck accidents aside, we eventually made it to Olympos. I instantly could see why the place was once a hippy meccah, everything here definitely moved at a much slower pace of life. I’m pretty sure that one of the biggest appeals of Olympos to the hippy-inclined population would be the multitude of ‘treehouses’ available for lodging in the area. Not necessarily located in the trees themselves (more just amongst them) the treehouses are small, basic wooden huts built on stilts. It seemed to be the norm that a huge traditional breakfast and dinner were also included in the price of your treehouse. Our abode of choice was Bayrams Treehouse. The rickety treehouse we were given was the definition of basic and creaked and squeaked any time we made the slightest move. Not a worry at all though, we only really used the treehouse to sleep in as the common area was one of the best I’ve ever come across in my travels! A huge outdoor and covered area was spotted with lashings of low lounges, cushy pillows and the occasional orange or lemon tree. In the mornings mountains of bread were served with yogurt, fruit, olives, tomatoes and eggs cooked to order as part of the (free!) breakfast. The provided dinners included dishes such as stuffed peppers, eggplant moussaka, fresh salads and traditional soups followed by juicy slivers of watermelon. The $21 Australian a night each we paid for the room and two meals made this a very budget friendly stop off indeed! The tiny village of Olympos is nestled beside a bubbling creek in a valley between two mammoth sheer rock faces. It wasn’t uncommon to glance up to the rock faces and see some tiny specks of colour identifying some rock climbers making their way slowly up the perilously steep precipice. 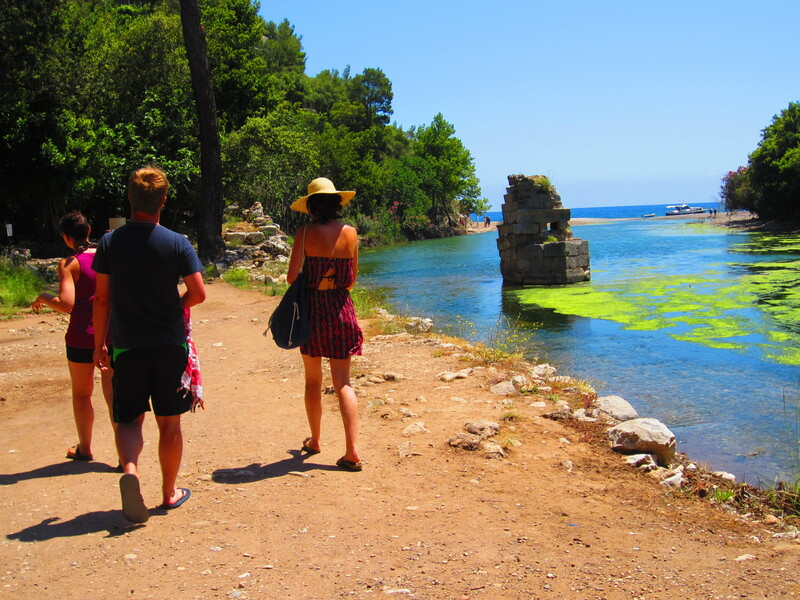 A dusty trail that led past the treehouse entrances and through the village eventually brought us to the Olympos ruins. 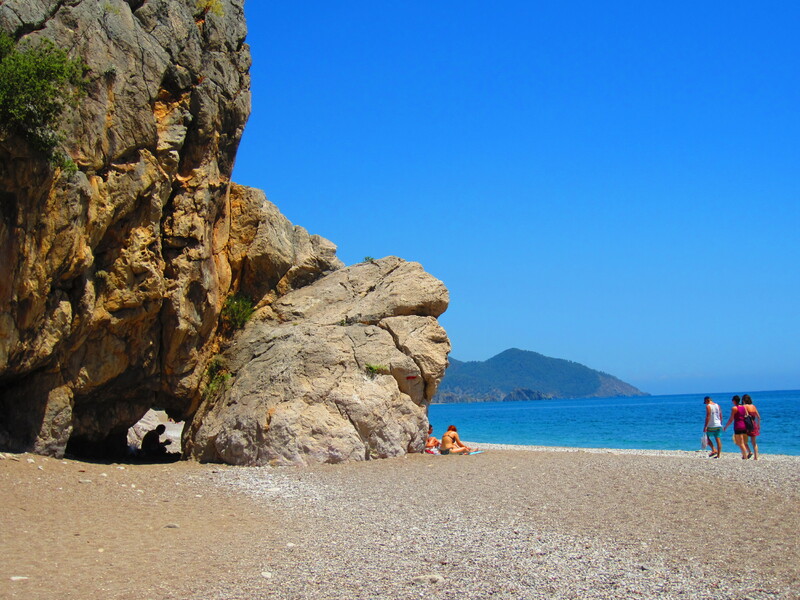 Whilst the Lycian Roman ruins themselves were not especially remarkable, their location next to a stunning pebbled beach made them quite memorable! Being not the most avid of rock climbers there wasn’t a great deal more to do in Olympos other than to relax and hit up the beach. Four of the blue cruise crew – Danielle, Erica and Paul from Canada as well as Paige from Australia – had come to Olympos as well. We all managed to get in some solid (and probably not so well deserved after the boat) amounts of relaxing marked only by the occasional stop for a slice of Gozleme or a scoop of sticky Turkish ice-cream. 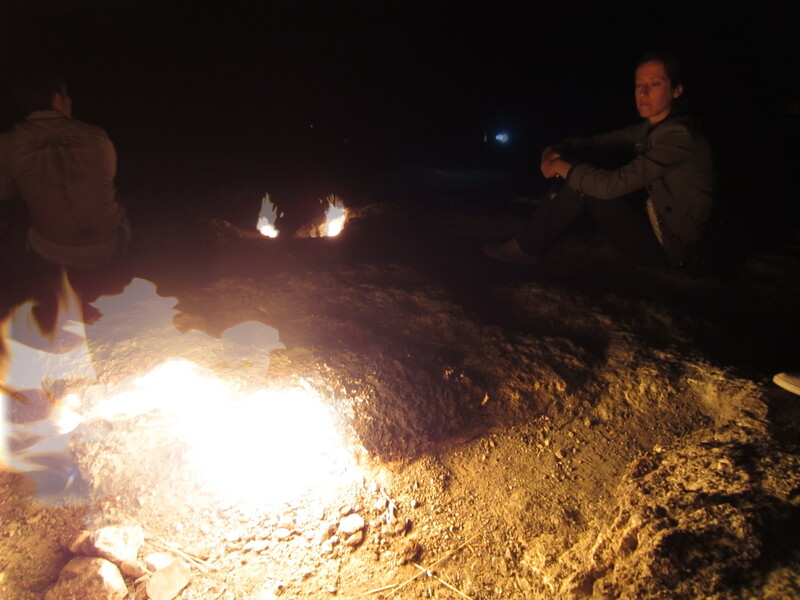 On our final night in Olympos, the 7 of us ventured to Chimera, around a 40 minute drive from Olympos itself. 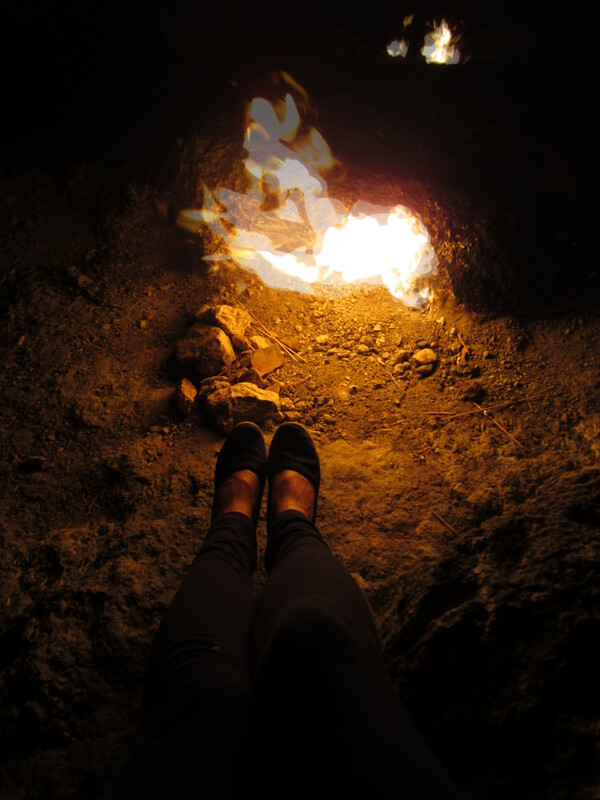 The place has been famous for thousands of years for the unusual phenomena of ‘eternal flames’ that flicker in various places on the hillside with no apparent fuel to keep them alight. Apparently this natural phenomenon is a result of the gradual leaking of a sort of methane gas from some fissures within the rock face. If the flames are covered they will go out, only to reignite after a minute or two. I had been told by some people we’d met earlier in the trip that the flames were quite underwhelming so I had been a little dubious about visiting. 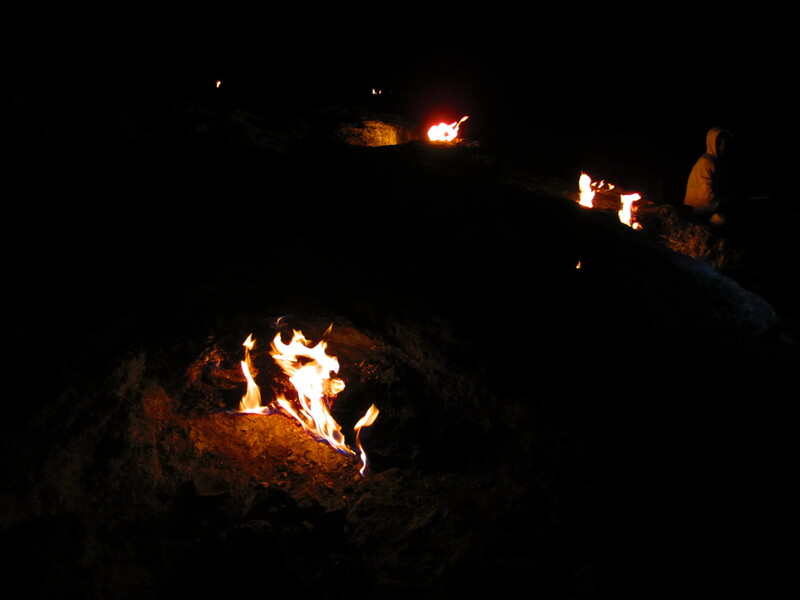 However, when we finally reached the flames after a twenty minute scramble uphill in the dark I was incredibly impressed by the whole spectacle! Around twenty or so patches of flames dotted the rocky hillside – all roughly about the size of a small campfire. The gas has been venting here for thousands of years and apparently around the time of the ancient Greeks the flames were much larger and were able to be seen by ships passing by at sea. It’s said that the ancient Greeks actually believed that the flames were the result of a mythical fire-breathing monster who had been trapped underground by Pegasus on his winged horse. Some reminiscing of our favorite of childhood foods on the previous evening had led to Paige having the brilliant idea of bringing some supplies with us to make s’mores on the flames. We managed to get a real little assembly line into action. I toasted (or burnt) the marshmallows over the flickering flames whilst Erica squished them onto a sweet biscuit over the top of a square of pistachio chocolate – a nice little Turkish touch! 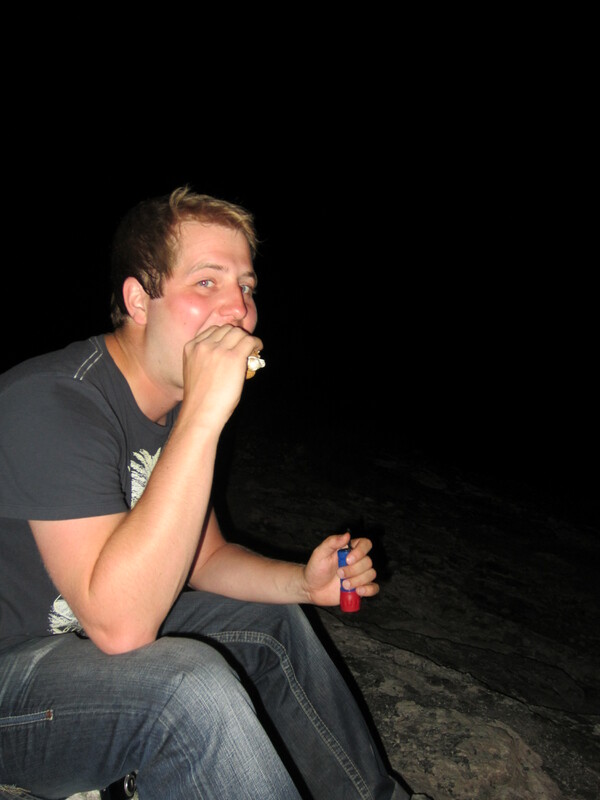 Paul tucks into a Turkish s’more! There were a few poor lost marshmallows on account of my dubious toasting skills but overall I think I can definitely say that the Turkish s’mores experiment was a huge success!